Delve into the delights of the Himalayas. 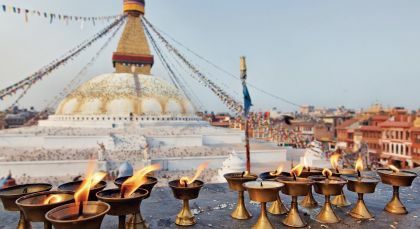 On this Himalayas tour, discover the picturesque mountainscapes, valleys and spiritual sanctuaries in the mountain kingdoms of Nepal and Tibet. 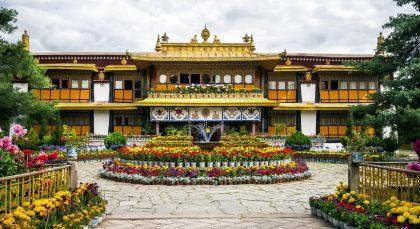 Highlights of your tour include the erstwhile home of the Dalai Lamas and Mount Everest – the tallest mountain in the world. 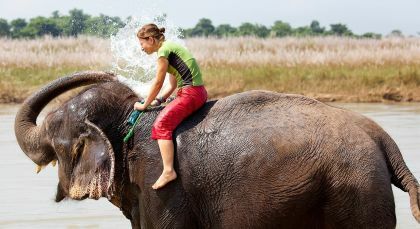 With visits to local homes, wildlife safaris in Nepal’s Chitwan National Park, and delicious cuisine waiting to be sampled, this tour offers deep insights into the Himalayan way of life. Encounter one of the most resplendent of Buddhist monasteries in Tibet, on this trip to the 15th century Tashihunpo Monastery. 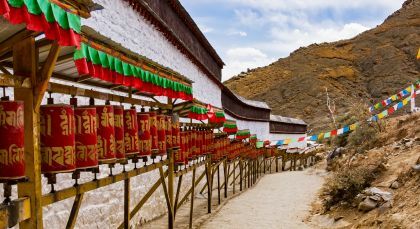 Set against the Himalayan hills, this monastery is the seat of the spiritual leader Panchen Lama, who is second in importance only to the Dalai Lama. 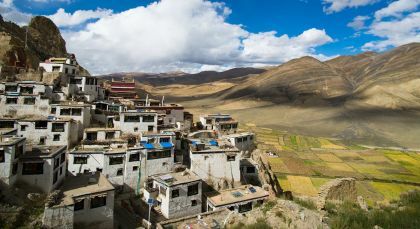 Admire the white washed monastic cells topped by a crowd of golden tombs where past Panchen Lamas rest. A huge wall hemming the complex is hung with intricately worked thangka paintings depicting Tibetan festivals – all washed in gold paint. The best surprise reveals itself as you gaze up at the biggest gilded statue in the world – the Golden Maitreya or Future Buddha. The massive statue is studded with precious gems and surrounded by innumerable golden thangka paintings of this powerful incarnation of the Buddha. Explore the many chapels, funeral chortens, beautiful paintings and mandalas, and stop by the assembly hall where nearly a 1,000 monks chant their prayers. If you’re lucky, you could catch them at a debating session within the complex. (Half Day; Private Activity & Transfer; Fitness Level: Easy; Please bring comfortable walking shoes). 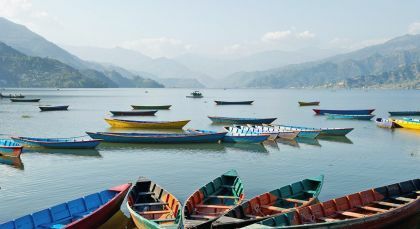 Jaunt into tranquility during your full day tour of Pokhara. Explore the incredible Shanti Stupa, a Buddhist temple that was built in 1947 as a symbol of world peace, located atop Anadu Hill. Discover one of the city’s oldest temples, Bindhyabasini Mandi, which is dedicated to Goddess Bhagawati. At the International Mountain Museum you can delve into the history of mountaineering and the Himalayan peaks. Head to Purano Bazaar in the old quarters, where the ancient architecture of Newari traders is on display through narrow streets lined with shops. 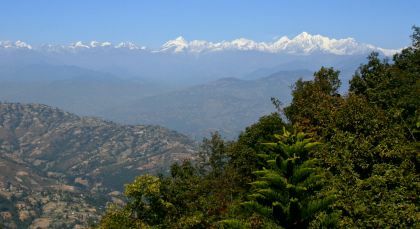 A one hour drive to the village of Naudanda (nine hills) boasts excellent views, as does a scenic boat ride on Pehwa Lake.